I can think of no better way to end this stream of posts on a memorable, food-filled Italian vacation. Pizza. Gelato. Two of the best foods in the whole world, unbelievably found in their highest forms in one city. 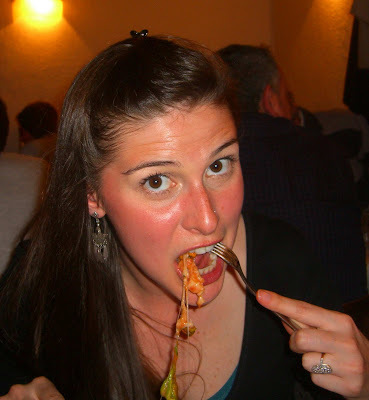 If you can’t cite pizza and gelato as two of the most convincing reasons that Rome is one of the greatest food cities ever, then, well, you just don’t know what you’re talking about. Phil’s satisfied smile says it all. But let me back up. Most people think they know a thing or two about pizza. Everyone has their favorite pizza style, be it thin crust or deep dish. Arguments are raged over whether the crust is the most important part of the pizza, or whether the toppings are the star of the show. Cheesy or not; saucy or not; pepperoni or ham and pineapple – pizza is definitely a food that everyone, food lover or not, has an opinion about. 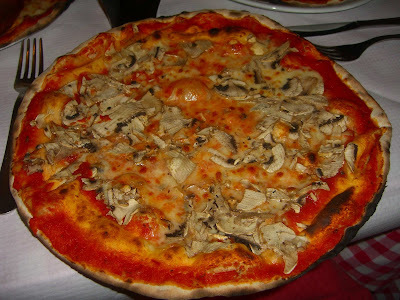 So I think it is fitting for me to describe to you my ideal pizza pie, and how I came to find that pie in Rome. Without a doubt, my perfect pizza must have a crispy thin crust, and must come from a wood-fired oven. The sauce must be well-seasoned and made with high-quality tomatoes, but it can’t steal thunder from the cheese and other toppings. I am vehemently opposed to sweet toppings such as pineapple, and can’t resist pepperoni’s salty, oily contribution. Now, I have certainly enjoyed many a pizza that do not fit these requirements, and I’ve written about them before. 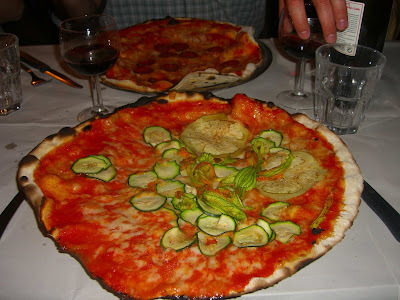 But throughout my trip down the Italian peninsula, I was on the search for a thin-crusted, wood-fired, cheesy, salty pie that would forever live in my mind as the ultimate pizza standard. On one of our first evenings in Roma, we grabbed a few pies from a charming joint down the road from our hotel. 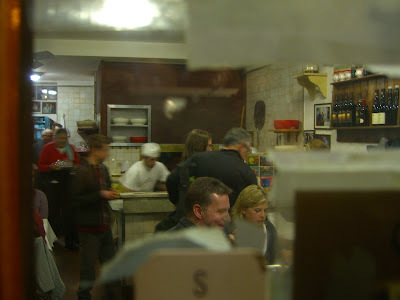 Da Francesco was always crowded with lively locals when we walked by, with tables spilling out into the street. We luckily snagged a table indoors. Phil ordered a pizza with prosciutto and it was certainly good, with a crispy crust from the wood oven and a great cheese-to-sauce ratio. 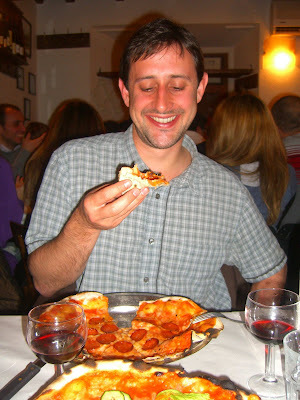 However, it wasn’t as good as the prosciutto pizza Phil ordered in Como, which had a sweeter sauce. The Como pizza also seemed to come from a wood-oven that was fired at a higher temperature, and that made the cheese more caramelized and the crust more bubbly and crisp around the edges. My mushroom pie was also good, but just not great. Phil and I were both disappointed that Da Francesco didn’t offer salame as one of their toppings. Overall a good pizza experience at a very reasonable price in an animated local spot. But, I was still on the search for THE pizza. Fortunately, I didn’t have to look too hard. The lines snaking around the block outside Pizzeria da Baffetto offer the first clue to the quality of pies. 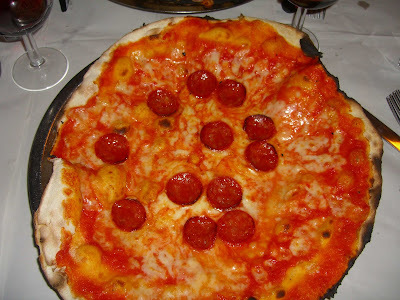 Almost every website, travel book, or blog I ran across claimed this place has the best pizza in Rome, and I must say that da Baffetto is all it’s hyped up to be. As we waited in line, I drooled through the window and watched the pizzaiolo turn out pie after pie. Here’s the view of the kitchen and front dining room as seen through the three inches of non-postered window space on the front door. After about 30 minutes, we were seated upstairs at a communal table with a pair of friendly British tourists on one side and a gruff Italian couple on the other. Da Baffetto is all business, and table turnover was on our waiter’s mind, so we were sure to quickly relay our orders. Not much time elapsed before we were graced with THE KING of all pies! 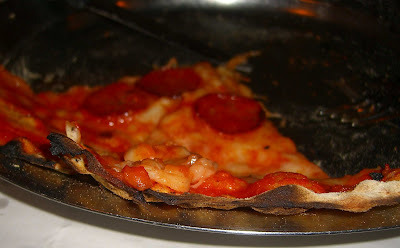 Each had a paper-thin, crispy crust that miraculously held up to the toppings. Phil was able to pick up the slices to eat them, but I did as the Romans and ate my pizza with knife and fork. I ordered the pizza alle vegetarian with zucchini flowers, zucchini, and eggplant. The vegetables were cut very very thinly so they were perfectly cooked after a short time in the incredible heat of the wood oven. They were also nicely seasoned with salt, an important touch that some pizzerias neglect. The pizza with pomodoro, mozzarella, and salame ordered by Phil just blew our minds. I mean, just LOOK at it!!! I had FINALLY found my pizza Mecca! 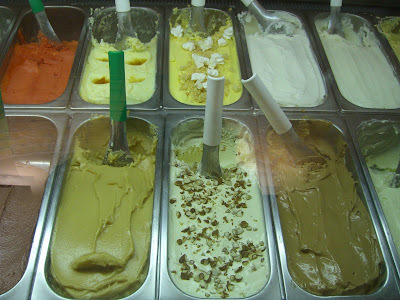 Speaking of Meccas… Italian gelato is spectacular throughout the country, but some way, somehow, Roma has the best. We tried innumerable gelati during our trip and it became so common that I stopped taking photos, but the Gelateria del Teatro in Roma stood out. Wow. I’m not a fan of super sweet or fruity desserts, so the pistachio and double chocolate gelati I ordered from Gelateria del Teatro constituted my idea of an ideal dessert. Impossibly rich and creamy… and just very flavorful, very pistachio-y and dark chocolate-y, not milky or icy like some ice creams can be. I was so engrossed in mine that I neglected to notice what flavors Phil and Laurie were enjoying. I am sure they were equally yum! See you have re-vamped the blog. Nice! Also this closing Italian advetnure sounds sweet and salty! I like! 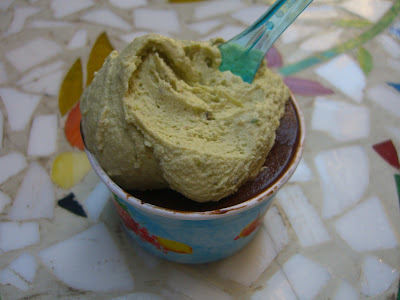 You might want to add your gelato experiences in Italy to the Tour del Gelato Blogroll! I LOVE the new blog look, lady! And that pizza totally takes me back to my trip to Venice...ugh. So jealous. Da Baffetto is great but, as you saw, lots of tourists and long lines. When we were living in Rome we used to love to go to Taverna Parione, just around the corner from Baffetto, on a side street off via del Governo Vecchio heading towards the piazza Santa Maria della Pace. 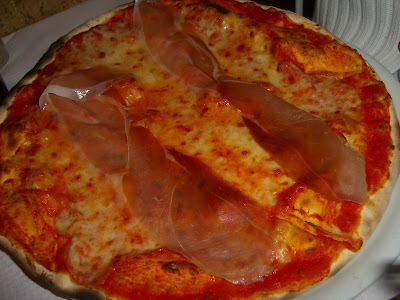 They have wonderful pizza, even more wonderful foccaccia with freshly sliced prosciutto and mozzarella. And a cheery but low key atmosphere. Hey Frank! 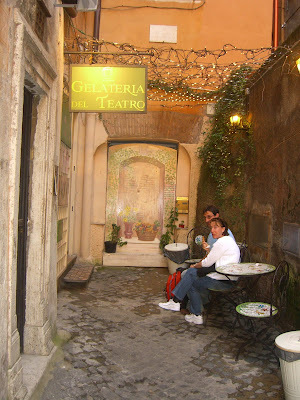 Must try Taverna Parione next time I'm in Roma - sounds excellent! A few Roman friends recommended Da Baffetto and warned me about the tourists and crowds but said the pizza was worth it - and I definitely agree. But, if I lived in Roma, I don't think I'd go there once a week or anything - too much hassle. Thanks for the reco and for stopping by!! Hi, Loved reading your blog. Just wondering if you could tell me the difference between a pizza, and a pizza pie? Thanks. Hi, loved reading your blog - very interesting. Just wondering if you could please tell me the difference between a pizza, and a pizza pie? Thanks. @Anonymous: thanks for stopping by, and glad you enjoy viCARIous! Pizza and pizza pie are the same - I'm from the Northern U.S. and perhaps it's a dialect thing, but we always say that we're in the mood for "pie," or that we're going out to get a slice of "pie" for dinner. I've known friends who work in pizzerias who also call their product a "pie" rather than a pizza. Hope that helps!